Today we are celebrating the launch of a brand new online Christian Creative Community: His Kingdom Come. This is an online Community where fellow Christians can encourage, share and learn about Christianity and explore the God-given creativity that he has put in us all. It will be a safe place to share your faith, be inspired, and explore creativity across many art mediums - journaling, mixed media, painting, bible journaling, textiles, watercolor and more. His Kingdom Come will offer free tutorials, technique classes, devotionals, crafts to celebrate the holidays, opportunities to go deeper in your faith and in your knowledge of God and the Bible. The website will also offer Christian artists a platform to host classes (free or fee-based) which you will be able to sign up for. A team of talented Christian artists have come together to launch this exciting new community. This blog hop is your chance to get to know them. It doesn’t matter where you start within the blog hop. Or you can start at the beginning with Diane. Each blog will have the complete list of participants. Bernice Hopper - that's me! As you visit each blog you will be given a letter eg. D. When you have collected all the letters they will make a word. When you have worked out the word email Bernice with the word. We will randomly choose 3 people who have the correct answer to win a prize. All entries must arrive by Noon (Pacific time) on Monday 3rd November. After retiring from teaching at the age of 43, I took a 4 year part-time course in Creative Embroidery. Subsequent work as a church administrator took up all my time and creativity was put to one side. 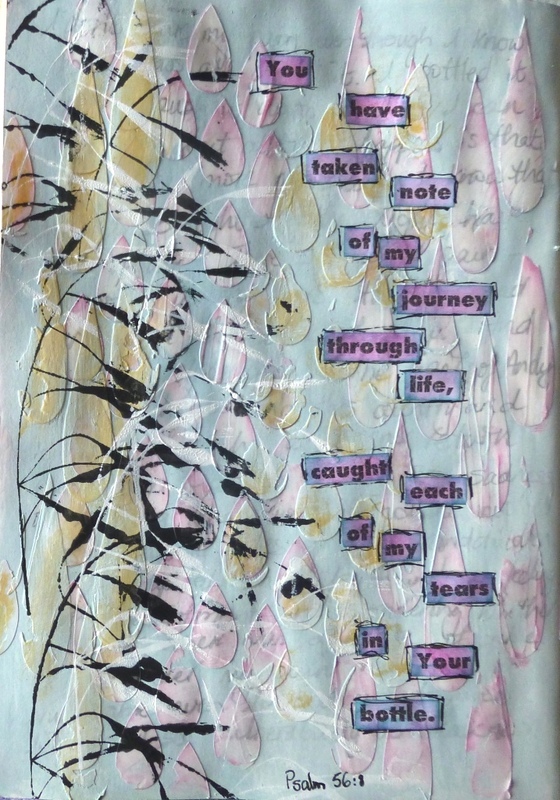 A second retirement enabled me to give time to scrapbooking, art journaling, mixed media and many online workshops. I live in England with Roger, my husband of 31 years and we have one son who is married and living in Sydney. I became a Christian 25 years ago. I currently runs art challenge blogs with a Christian bias. I had attended my local Methodist church from the age of 8 to 18 but once I got to college I didn’t go to church again. Twenty years later I started going to church because I saw an article in the local free newspaper about how God had freed the writer from the inexplicable anger she felt. I attended the church for a while and a small group where I was allowed to ask lots of questions. I became a Christian at an outreach the church held when a visiting Mime Artist performed a mime about Moses and his stick becoming a snake. You’re thinking ‘what!’ I know it doesn’t make sense but there you are. The preacher preached on something that spoke to me that I can’t remember and at the end of the evening I accepted Christ into my life. How does your faith impact your creativity? I don’t always make faith related projects but I am very aware that my creativity is a gift from God. I think it helps me steer clear of workshops that wouldn’t be good for me spiritually. What is your preferred medium of creativity? I’m a bit of a Jill-of-all-trades and master of none. I flit between media and styles depending on what my project is. What areas of creativity do you dabble in? What is your role within the His Kingdom Come team? I am a host for the Textiles group and the Photography group. I am supporting Diane & Shonna in various administrative tasks. What are your hopes for this new community? I am hoping it will be just that! A community! Not just another project driven website but a place to share our faith, our creativity, our needs, our prayers, the things that God speaks to us, a place of encouragement. I have several art challenge blogs and creative Bible Study blogs which you can find through the tabs at the top of this blog. I hope you are as excited as I am at being part of this online venture. Our vision is to build an online community not just be a project-led site. A place where you can find encouragement, share your heart and your problems and find help. Thanks for sharing your heart with us Bernice, it is such a pleasure and a blessing to be working with you! I really enjoyed getting to know you better...and your faith journey. Loved the projects you shared. Thanks for being a part of this community and your leadership roles. Hey Bernice. I am having a problem sending you an email with the word. Just thought I'd like you know. Hi Bernice! Your blog is just beautiful and work is fantastic! I look forward to getting to know you! Benice, so nice to learn about you! Thank you so much for all your work and generosity. I am looking forward to the coming year!